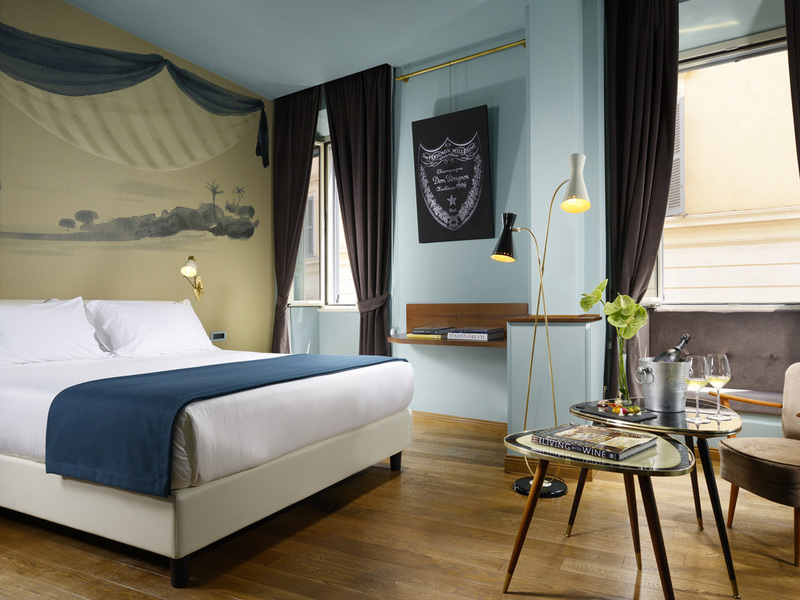 The Guest’s comfort has been the main focus of Hotel De’ Ricci’s founders: the smallest Suite measures 24 sqm, while the largest is a spacious 67 sqm. All of the Suites are very luminous and characterized by a decor that features original vintage furniture. On the walls of each Suite are frescoes of iconic scenes in Rome and perspectives of Roman life, painted by Andrea Ferolla, creator of works and illustrations in prestigious homes and venues worldwide. The spacious bathrooms define elegance, with a mix of black tiles and retro style sinks. Treat yourself to the elegance of the warm and intimate setting of the Junior Suite. Immerge yourself in the exclusivity of one of the two Deluxe Suites. The sleek style, spaces and attention to detail will dazzle you!